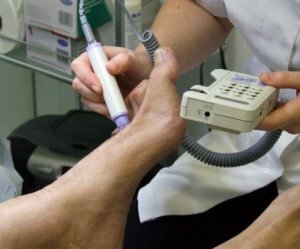 Your podiatrist or doctor should listen to the arteries in your feet at regular intervals using a Doppler ultrasound machine and report the findings to you. A lot of information can also be gained from a visual inspection of the foot. Typically, a foot with poor blood flow will have little or no hair, shiny skin, thin skin with a loss of fat below the skin, poor pulses and colour changes. The foot will be pale when elevated and mottled red/purple when hanging down. Cholesterol plaques in arteries occur more quickly in diabetics as retention of fat within artery walls is increased and glucose in the blood makes the collagen within artery walls stiffer. Arteries then are more likely to have the rough surface irregularities that first allow blood to clot within the vessel. Blood clots within vessels can come loose and float with the blood until they become wedged in a narrow area which can cause the death of any tissue downstream to the blockage which becomes deprived of blood. This might be a toe (gangrene), a section of lung (pulmonary emboli), heart (heart attack) or brain (stroke or TIA, transient ischemic attack). Even without a clot, thickening of artery walls (or hardening of the arteries) reduces blood flow to tissues, reduces oxygen to skin and flesh, limits antibiotic medicine and white blood cells from getting to infections and delays or prevents the healing of wounds. To read this peripheral vascular disease Q&A session as a single handbook, or to access the downloadable / printable version, please browse to our Diabetes Info Sheet. Alternatively, use this link to return to the Podiatry FAQs Blog.